Constraints in acquiring cloud computing services remain an underlying challenge for state leaders in their efforts to modernize IT systems, according to a new survey released by StateScoop. 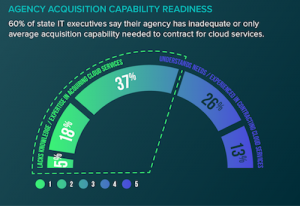 Overall, 60 percent of state government IT executives in the survey reported their agency currently has inadequate or only average acquisition capability needed to contract for cloud services. Additionally, 6 in 10 IT respondents rated government contract vehicles available for acquiring cloud services “difficult to use” or average at best. The findings show a growing number of state IT officials plan to shift their IT investment strategies to include cloud services over the next three years, according to the study. Seven in 10 IT leaders indicated their agency will devote most of their IT investments toward a combination of cloud models — including government-only community clouds, commercial clouds or a hybrid approach — rather than on-site, government-run data centers over the next three years. The findings from the StateScoop survey are outlined in a new “State Cloud Readiness Report,” which explores state agencies’ progress and challenges to adopt cloud computing for various workloads. The study, sponsored by VMWare, Intel and Carahsoft, was based on responses from 150 prequalified senior federal government IT decision makers. About twice as many, however, are still at the preliminary assessment or selection stage of Gartner’s six-stage cloud readiness scale. The investment shift reflects greater readiness by state agencies to provision and automate cloud services. It also reflects growing confidence in the ability to manage mission services and applications using cloud technologies, despite lingering security concerns. A federal program that certifies the security of cloud services appears to be helping: Seventy-two percent of respondents found General Services Administration’s Federal Risk and Authorization Management Program, or FedRAMP, of average or greater than average help to speed the process of meeting cloud security standards. The top two reasons now inhibiting agencies from moving faster to the cloud, according to IT officials, are the complexity of extending legacy applications to the cloud and concerns about securing them in a hybrid environment. State IT officials, however, also reported taking a number of steps to move faster to the cloud. In particular, IT leaders are looking to cloud providers to help more with migration and they are selectively replacing applications with cloud-ready alternatives.